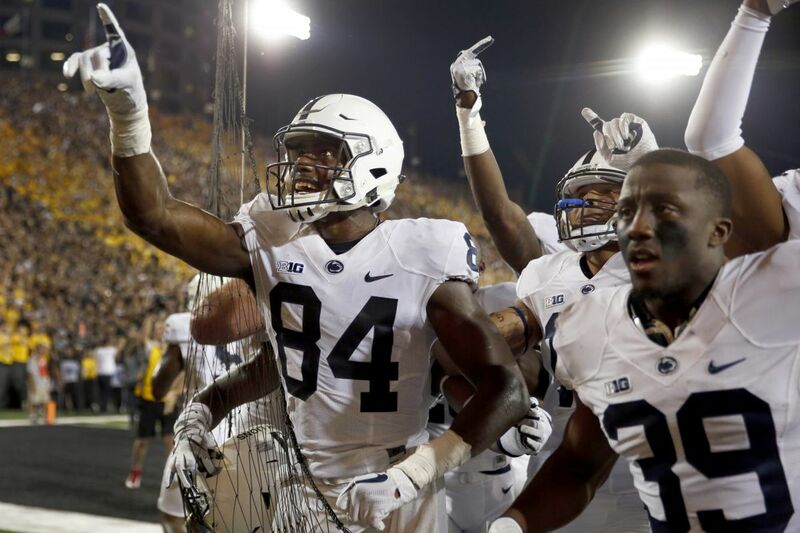 Penn State wide receiver Juwan Johnson (left) celebrates alongside teammates after catching the game-winning, walk-off touchdown pass against Iowa on the road. IOWA CITY, Iowa – After reaching a career high for rushing yards and setting a Penn State program record for all-purpose running Saturday night, Saquon Barkley turned pass blocker and saw Trace McSorley and Juwan Johnson hook up for the winning touchdown on the last play of the game to silence the Iowa home crowd. On four-and-goal from the 7, with four seconds left when the ball was snapped, McSorley fired a 7-yard pass to the 6-foot-4 Johnson for the score that enabled the fourth-ranked Nittany Lions to gain a 21-19 victory over the upset-minded Hawkeyes at Kinnick Stadium and remain unbeaten. "I told the guys in the locker room, if you look at any good season, there's always one game where a team has to gut it out and find a way to win, and we were able to do that tonight," Penn State head coach James Franklin said. The Lions (4-0, 1-0 Big Ten), who got a career-high 211 yards in 28 carries and a school record 358 all-purpose yards from Barkley, fell behind in a game for the first time this year when they trailed 7-5 at halftime. They saw the Hawkeyes (3-1, 0-1) regain the lead, 19-15, on a 35-yard touchdown run by Akrum Wadley with 1 minute, 42 seconds to play. The Penn State offense moved the ball at will against Iowa's defense, outgaining the Hawkeyes 579-273 and running 99 plays to its opponent's 45, but had trouble finishing off drives. This time, however, needing to go 80 yards in 1:36 with two timeouts, it found its rhythm behind Barkley and McSorley. The 12-play drive featured a pair of fourth-down conversions, the first being a 6-yard pass from McSorley to Saeed Blacknall that gave the Lions a first down at their own 46. They picked up first downs on the next three plays – McSorley's 12-yard run and his completions of 18 yards to Johnson and 14 yards to Barkley. The pass to Barkley, his 12th and final reception of the night, gave Penn State a first and goal from the 10. A 3-yard pass to tight end Mike Gesicki and two incompletions left the Nittany Lions with one last gasp from the 7, and Franklin took his last timeout. "I felt like with Juwan, we had a height advantage and felt we could kind of slip him through the middle of the field," Franklin said. "Trace hung in there and our offensive line battled to give us just enough time to get him through there. But we just wanted to take some time to talk it through and make sure we weren't rushing on the last play of the game with a chance to win." The Hawkeyes blitzed and Barkley blocked middle linebacker Josey Jewell, who had 16 tackles, an interception and a fumble recovery. That gave McSorley the time to find Johnson, the former Glassboro High School star who went as if he was going to slant outside, then worked back toward the middle and caught the pass. McSorley finished 31 of 48 for 284 yards. "He's known as a bull rusher so I was kind of like, it's the end of the game, the game's on the line, I've got to get in there and I was able to get a block," Barkley said. "Then I looked downfield and saw guys crossing and the ball kind of go through and Juwan making an unbelievable catch and I started going crazy." It was quite a night for Barkley. He hadn't touched the ball on more than 18 scrimmage plays in any of his first three games, but had 40 touches Saturday night, dazzling the crowd of 66,205 with his fakes, his change of directions and even a play where he leapt over one would-be tackler and bounced off another as he came down. He scored Penn State's first touchdown on an 8-yard run. "I cannot imagine there's a better player in all of college football," Franklin said. "This guy is special. I don't know yet what his stats were, but every time he touched the ball – I don't care if it was a 20-yard run or an 8-yard run, it was something special, it really was."